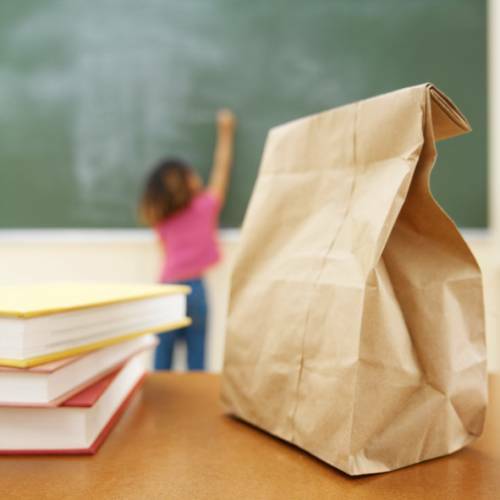 How many of you remember carrying your lunch to school as a kid? Did you carry it in a little brown paper bag? So many of us used to. But, with the convenience of fast food restaurants, snack machines and even cafeteria’s in our workplaces, many of us have forgotten about the art of packing our own lunch. We think it’s time to bring it back! Well… maybe not the actual brown paper bag. But, packing your own lunch (in a reusable lunch container, of course) can benefit your waistline, as well as the environment. Below are our top 3 tips to make it easier for you to get back in the habit, especially since Mom isn’t here to pack it for us anymore! 1. Pack it the night before. Let’s face it. It is hard enough to get everybody up, ready and out of the house in the mornings. The last thing you want to do is add another step, like making your lunch, to that crazy mix. If you pack your lunch the night before, (right after dinner, or when the kids go to bed) you’re more likely to stick with the plan and get to work with your homemade lunch. 2. Keep it simple. Just because you are taking your own lunch doesn’t mean that it has to be a gourmet specialty that will make everyone else in the office jealous. Things that can be put together very easily, and that are fairly mobile will be a great choice. 3. Include one food from each food group. We all hate those late afternoon hunger pains from an unsatisfying lunch. Avoid those by including foods from each food group. Proteins will keep you fuller, longer, while the others will help keep you fully satisfied. So, exactly what kind of lunch are we talking about? Included below is an example of an ideal lunch that is simple, filling and downright tasty! Turkey sandwich: Include light miracle whip, mustard, lettuce, tomato, onion and any other vegetables you enjoy. If you like avocados, they will also add a great taste to this sandwich. Cottage cheese and fruit: Any fruit is great with cottage cheese. But, berries in particular provide a great flavor combination and are full of antioxidants. Lunch is also a great time to get some of your recommended daily water. So, ditch that diet soda and enjoy an ice cold glass of water instead. As good as this meal is, you will get tired of it if you eat it every day. So, if you are struggling to come up with your own bag lunch ideas, be sure to check out “Bag Lunches and Snacks” available at www.NCEScatalog.com. May is a usually a busy month for everyone. But, it is especially busy when it comes to celebrating food! From asparagus to hamburgers and BBQ to strawberries, May is the time to use all of these foods because they are in season, fresh and just fun to make. To get everyone celebrating, we’ve put together a whole meal worth of recipes incorporating all of the foods celebrated during the month of May. Get some multi-grain tortilla chips and pair them with this delicious ‘Salsa Fresca’. It’s so simple! 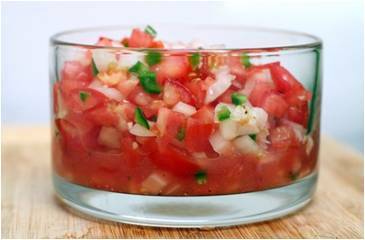 Mix all your ingredients in a bowl and Joila, you have a fresh bowl of salsa. This grilled summer favorite will be simple and also satisfy your BBQ craving! Mix all of your ingredients together. Patty the burgers and grill. Top these delicious burgers with fresh lettuce, tomato, pickles and condiments. You’re sure to please the whole family! 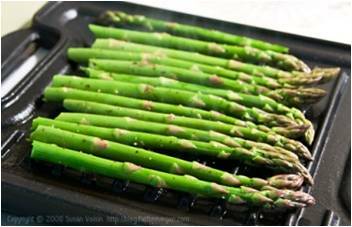 After you flavor the asparagus with the oil, salt and pepper, grill it. Be sure to turn it so that all sides cook evenly. This simple cobb salad is a throwback to the salads you had growing up. Mix it up and enjoy. Make a base with your romaine lettuce. Then, lay all the other toppings across the top for a great presentation. This salad is great with a light ranch or honey mustard. But, can also be enjoyed with any dressing of your choice. Nothing is more refreshing on a hot summer day than a bowl of fresh strawberries… unless of course you add Angel Food Cake and Whipped Topping to the mix. In a deep bowl, layer your ingredients. 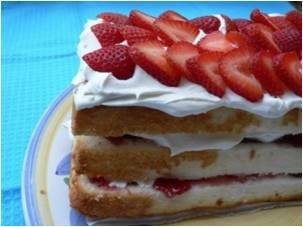 1st, angel food cake. Then, whipped topping. Place strawberries on top of the whipped topping. Then repeat this layering process as many times as your bowl will allow. We hope that your entire family will enjoy sharing this early summer meal, celebrating the many flavors of May! In honor of National Herb Week, we would like to take a minute this morning to encourage you to plant an herb garden of your very own. Do you currently cook with many fresh herbs? If so, you already know how the various flavors can really infuse any meal with intense flavor. If you don’t, you may not quite understand that yet. But, today’s the day, stop by the grocery store on your way home and pick up some fresh herbs to spice up your dinner. Whether you’re having spaghetti, baked chicken or grilling out, throwing some fresh herbs in the mix will really wake up your taste buds. After you taste the difference, you’ll be excited to plant your own herb garden to enjoy these irresistible flavors all the time! Now that you’re ready to have your own garden, where do you start? Where to plant your herbs? Be sure to plant close to your kitchen. One key to success is making sure that you can access your fresh herbs as easily as you can access your pantry. Plant your herbs where they will get full sun. Herbs grown in full sun will be stronger and more flavorful than those grown in the shade. What to grow your herbs in? A decorative pot is always a good choice, especially if you are limited for space on a full garden. Planting in a pot allows portability so that you can adjust the level of sun your herbs are receiving. 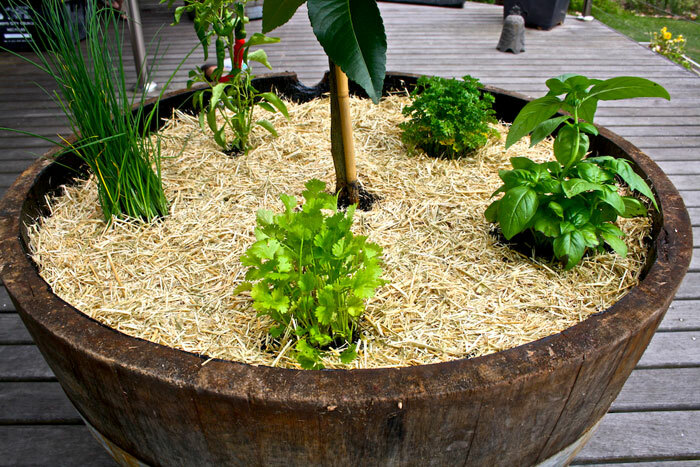 Soil that is healthy and easy to mix around will help your herbs grow better. Herbs will not grow in just any soil. They need to be cared for similar to any flower that you would plant. What herbs should you grow? Be sure to grow some Oregano. This is a very common seasoning. You can use it in almost anything! So, plant plenty of this one so that you don’t run out. Basil is another great herb to have on hand. Although basil provides a great flavor to the dishes you add it to, it takes a lot to get the flavor to be noticeable. Make sure you plant a few of these so that you don’t deplete your supply for every dish you mix it in to. Mint is a fun flavor that a lot of us don’t use often. So, planting this may encourage you to incorporate it in to your meals, or dessert. Now that you know the basics, you can get started planting your very own herb garden. Remember, it doesn’t have to be big or overwhelming. Just start small and let it grow every year. Also, be sure to experiment with different herbs. You never know what flavors you may discover that you’ve never tasted before. NCES Presents… A Cinco de Mayo Celebration! Join us! Join us as we adventure in to a Cinco de Mayo celebration piled high with flavor, minus all the extra calories!